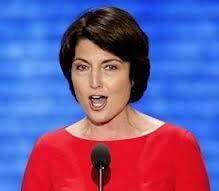 Cathy McMorris Rogers and the SOTU response. Yoda or Jindal? It’s the most unenviable job in politics: delivering the response to the President’s State of the Union address. A high-wire act performed over circling sharks, the number one goal is simply to avoid coming out of it as chum. To emerge merely a chump can be considered success. The problem is that everybody remembers when it all goes wrong, but few remember when it goes OK. Bobby Jindahl’s train-wreck in 2009, and Marco Rubio’s water-bottle moment in 2013 both leap to mind, whereas Mitch Daniels workmanlike performance in 2012 has fallen off the radar. If delivering the SOTU response is a plum handed to rising stars, then it’s a Hunger Games of a plum. Most of those chosen are going to wind-up pulp. Delivering a successful refutation is never a job for the angry. An angry, fired-up politician with an axe to grind and a name to make, Bobby Jindal for example, will fall straight into the trap of attempting a sweeping refutation of everything that the President just said. Striding to the microphone, they’ll hurl the metaphorical bowling ball of their indignation down the alley and hope for a strike that sends the President’s pins a’flying. The problem is though, that until the President actually speaks, nobody knows for certain where those pins are going to be placed, or on which facts they are going to be based. This means that unless the respondent is very, very lucky, they’re going to send that bowling ball straight into the gutter, where it will land with a dull and heavily press-coveraged thud. It’s not quite the sound of tumbleweed, but dreadfully close to it, and precisely what panicked Marco Rubio into groping for that water bottle last year. So instead of bowling pins, let’s talk sweaters. Woolen ones. The President’s State of the Union, will be presented as a perfectly stitched garment of arguments that knit together into one broad theme. A successful SOTU respondent does not need to shred that sweater. They merely need to pick lose a single thread and then tug just enough so that the news networks scent an opportunity and finish the unravelling before the President is even back in the West Wing. That thread will be found in one of two seams. It might be a dubious fact that can be directly challenged, or it could be in a slightly too sweeping phrase. All the respondent now needs to do is to get a hold of that thread and use a wonderful little toy called The Yoda Argument. Remember the famous line from Star Wars? A leads to B. B leads to C. C leads to D.
The respondent does not need to go for a kill stroke, they just need to find that thread. It’s a big thing to ask though. The respondent needs to resist the all-or-bust temptation of the furnace-blast rebuttal, and that’s why Rep. Cathy McMorris Rodgers could be such an interesting GOP choice for 2013. Despite being a highly ranked Republican, they don’t let her out to speak a great deal. Her style is generally cool, and tends towards the forensic. For so long as the Tea Party demanded speakers who came with a certain spittle-flecked fundamentalism, her cooler style didn’t always fit. Hence the low profile. Her choice for tomorrow night’s performance could therefore prove to be a smart one. Will Cathy McMorris Rogers remain forensic enough to start the SOTU unravelling, or will she fall into the trap of ages, and make a complete Jindal of it? Well, it didn’t work. She came across as though she was reading a bed time story. She also, unfortunately, had a bad case of dry mouth and when she paused there was an audible, disturbing, clicking/sloshing sound that sounded like something from a space alien movie. Add to that the fact that she didn’t really pull on a thread of any consequence and it appears as though we have, yet another cannon blast and a photo up in the clouds.